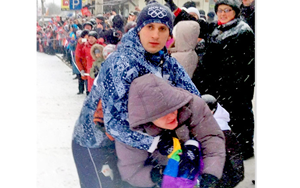 A gay Russian protester was tackled to the ground and detained by Olympic security on Saturday for unfurling a rainbow flag during the Olympic torch relay as it passed through his hometown of Voronezh, 560 miles north of Sochi, where the games will begin Feb. 7. Photos uploaded by his friends show Pavel Lebedev pulling out the flag and then being detained by Olympic security personnel, who wrestle him to the snow as they wait for police to arrive. Lebedev, reached by The Associated Press on the phone, said he was still in the police station and undergoing questioning. The Olympics being held in Russia as America and the world standing by while the Russians dehumanize the gay members of their society is disgusting, and completely against everything we are supposed to stand for. I feel nothing but disgust and shame for those who participate in the Olympics and are turning a blind eye to Russia’s human rights abuses.